Registration of participants. 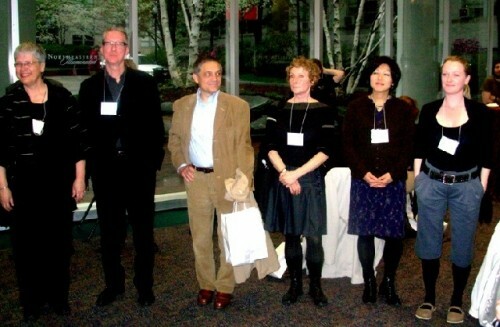 Images from 2007 conference. Mary Sherman greeting participants during opening ceremonies. A group of international delegates. A panel discussion held at MIT’s Kresge Auditorium. Curators Uta Meta Bower and Linda Norden discussed there work with biennials. 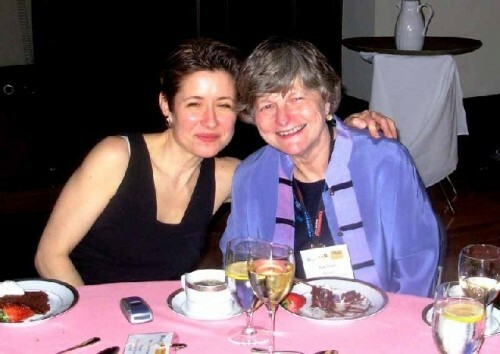 Mary Sherman with Mass Art President Kay Sloan at the gala dinner at the college. Delegates discussing international opportunites over dinner. 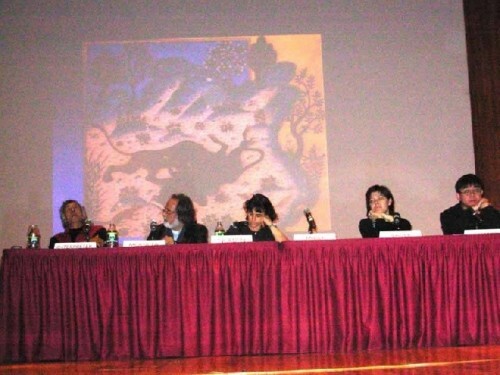 A panel discussion at Mass Art. Presenter Dorothea Fleiss from Germany. The second conference: "International Opportunities in the Arts" is only a few weeks away, but has been two years in the making. 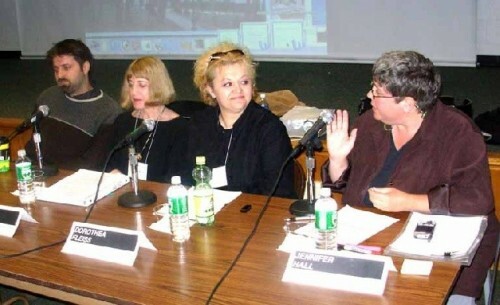 The first conference was also held in Massachusetts in 2007. 2007 Hiemer Review From April 3 to April 5, the Boston Omni Parker House Hotel, in downtown Boston, will be hosting all visitors. The conference addresses artists, architects, writers, and musicians and the following subjects will be part of the agenda: How to find the right program; national and international residencies, short and long-term, independent or connected to schools; grant funding institutions and how to apply; international exhibitions, art fairs, and bienniales. And, when there is time, art and cultural institutions and the City of Boston will welcome visitors. 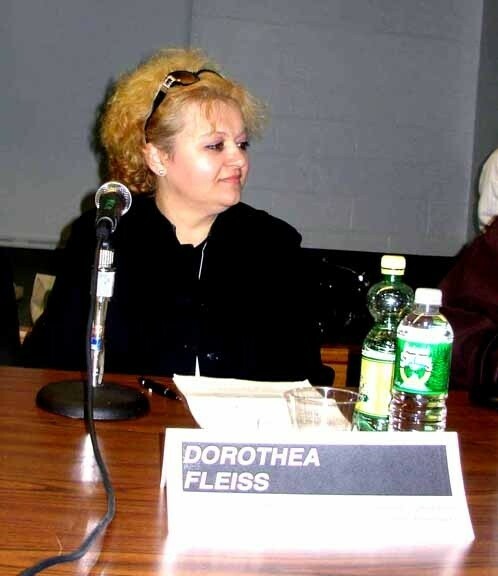 The idea for the original conference was sparked at an artist-retreat in rural Romania in 2004, where the Romanian-German artist, Dorothea Fleiss, has held workshops/symposia, lasting ten days, for a decade and invited up to70 international participants each year. 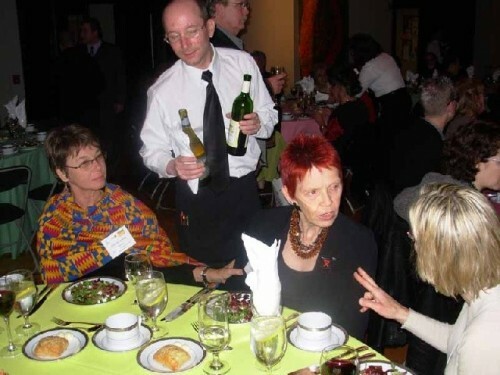 Mary Sherman, the director of TransCultural Exchange, and a participant at the time, decided later to make such opportunities, which are actually offered world-wide, public and open to a wide audience. And so, many of the more than 70 representatives of cultural institutions from 40 countries, large and small, are flying in from every continent (often at no expense to the conference) to introduce their work and organizations to the American audience. The director of Germany 's Schloss Solitude, Jean-Baptiste Joly, commented: "A wonderful opportunity to discover another side of the US reality, involved in culture and education, friendly, peaceful, open to otherness and generous. Indeed another American voice than the usual one you hear, read, or see in the media." The price to the three day conference is currently a very reasonable $ 265 for all panels and workshops, and a room at the Omni Parker House is $ 189/ night, until February 28. On April 1st, the price to attend the conference will rise to $ 350. At the end of the 2007 conference BFA Review 2007 all attendees were asked to evaluate their experience and the Dartmouth Center for Policy Analysis, at the University of Massachusetts conducted the survey. More than half of the artists at the conference responded and very positively. 82 % rated the conference as excellent or good with the following comments: "A wealth and value of information, residencies, and exchange of ideas" "A unique opportunity for working with others internationally." Many respondents believed that the conference would benefit their career. Within a few months after the first conference, 25 artists received invitations to residency programs and many more were invited to participate in international exhibitions. There were job offers, and grants received. Connections made at the conference came to fruition later and friendships and professional ties started there. Mary Sherman, the director of the conference and TransCultural Exchange wrote recently: "A little known fact is that there are many places around the world looking for artists. And, these international artist residency programs are an ideal step into the international art arena. Not only do they offer artists the chance to learn from another culture, meet artists from other countries, and find new audiences for their works, but these programs often attract a new type of artist as well Â– those that not only make art, but curate, produce exhibitions, write criticism, and are in touch with other, like-minded artists around the globe. Attending a residency program, thus, can create a ripple effect that over time will increase, broaden, and expand an artist's creative and economic growth." Clearly, Sherman is the perfect example of the international artist, who has created her own opportunities. 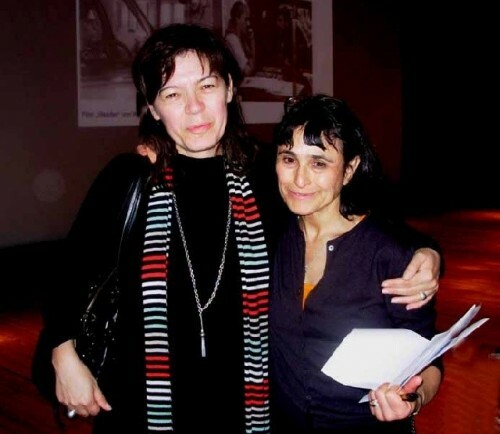 She has also curated and administered world-wide traveling exhibitions and projects. She is inviting the creative woman and man to follow in her foot steps, one step at a time. And attending this conference, and making the most of it, may just be the first step into the wider cultural and peaceful world.